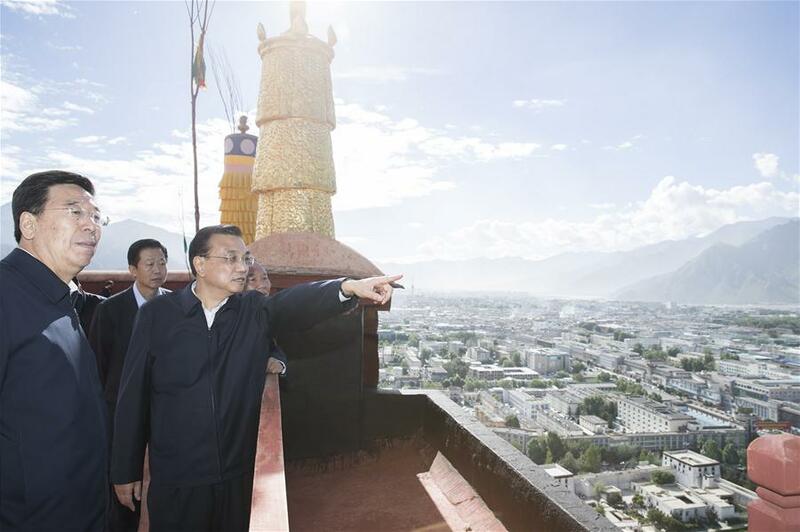 (TibetanReview.net, Jul29, 2018) – In a rare visit to the Tibet Autonomous Region (TAR), the context and the special purpose of which is not clear, Chinese Premier Li Keqiang has vowed to continue to boost infrastructure spending to improve the region’s economy while calling on its Buddhist leaders to defend ethnic unity. He has also called for sustainable development and the improvement of people’s livelihood. During his Jul 25-27 tour, Li has visited the site for the construction of a major tunnel for a new railway link with Sichuan Province, as well as the capital Lhasa and the southern prefectures of Nyingtri (Chinese: Nyingtri) and Lhoka (Shannan), reported the scmp.com Jul 27. While senior Chinese leaders do visit the region on major anniversaries, presidents or premiers seldom make the trip, the report noted. It added that President Xi Jinping visited Lhasa in 2011, when he was vice-president, for the 60th anniversary of communist troops entering Tibet. Nothing seemed to be particularly special as regards the itinerary and the meetings he was reported to have had. The official Xinhua news agency reported Jul 29 that Li talked with officials and residents, learning about local economic and social development, and extending his good wishes to people of all ethnic groups in Tibet during his visit. In Lhasa on Jul 26, Li had met Buddhist leaders at Jokhang Temple and urged them to defend national ethnic unity. He called for patriots from religious circles in the region to help safeguard national unification, ethnic unity and social harmony, the official Chinadaily.com.cn reported Jul 28. The Xinhua report also cited him as saying Tibet has been an inalienable part of China ever since ancient times. At the Potala palace, Li has expressed the hope that Tibet could stick to strategies and policies of the Communist Party of China to achieve development and prosperity, safeguard national unity, enhance solidarity among ethnic groups, promote social and economic development, and maintain lasting peace and stability in the region. 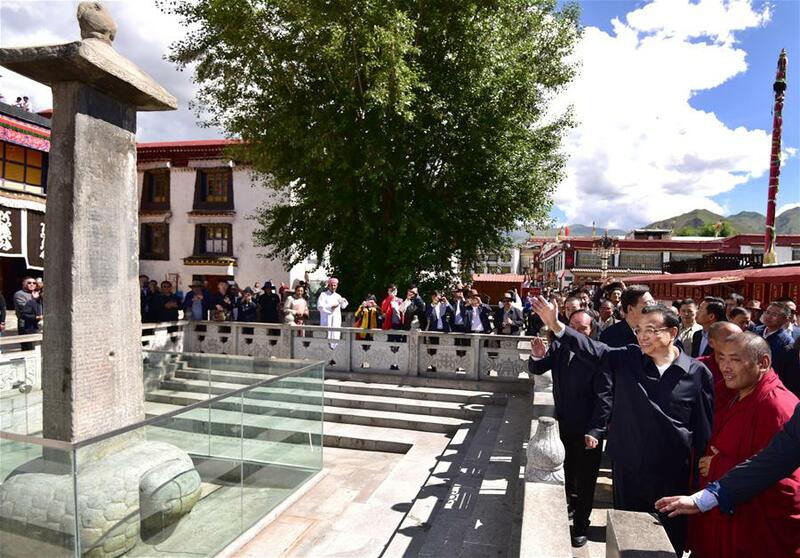 He had also stopped at the historic Sino-Tibetan Treaty Inscription that was stated to mark an alliance between China’s Tang dynasty (618-907) and Tibet in the early 9th century. Beijing calls the pillar a symbol of ethnic unity while Tibetans assert it as proof of their historical independence. The day before, the Chinese premier was reported to have visited a construction site in Lhokha on a tunnel for the Sichuan-Tibet Railway from Lhasa to Nyingtri. The section is a vital part of the Sichuan-Tibet Railway, which is another lifeline for the plateau that will connect it with other provincial regions when completed, the Chinadaily.com.cn report cited Li as saying. Li has called on the workers to make the railway a high-quality route that can stand the test of history. The Sichuan-Tibet Railway is a key project for China’s 13th Five-Year Plan period (2016-20) and has an overall investment of 270 billion yuan ($39.7 billion). Earlier, in neighbouring Nyingtri, Li starting his TAR tour on Jul 25, was stated to have visited a village that had been relocated from a poverty-stricken area and to have stepped into the house of a villager named Kungsang and enquired about his income, his children’s education and local healthcare services. He was also stated to have visited the junction of the Nyangchu and Yarlung Tsangpo rivers in Nyingtri. As “a water tower” for China and Asia, the TAR should protect its water resources and vulnerable ecology, the premier was reported to have told local officials. The report noted that Li’s Tibet tour came as President Xi Jinping was on a 10-day trip to the Middle East and Africa. No major policy announcements or crackdown calls were reported to have been made during what seems to have been a pretty benign visit. Beijing’s usual high profile visitors to the TAR are the top party leader overseeing ethnic minorities and religion – often the chairman of the national political advisory body – while major anniversaries have been marked by a vice-premier leading a central government delegation to Lhasa, the report said, citing The Beijing News. Other Politburo members have occasionally visited the region, while Jiang Zemin and Hu Yaobang both went to Lhasa as party general secretary in 1990 and 1980, respectively, the report noted.